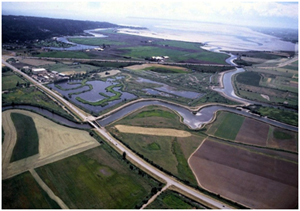 Purpose of Wildlife Management Area: To conserve a mosaic of wetland, riparian, and open field habitats for migratory waterfowl and other wildlife within the Fraser River Delta and Pacific Flyway. The Serpentine Wildlife Management Area is situated directly south of the Serpentine River in Surrey, a short distance upstream of the Boundary Bay Wildlife Management Area. Wildlife: Despite its relatively small area the Serpentine Wildlife Management Area supports wildlife populations that are surprising in both numbers and species richness. It is situated on a major regional flyway for migratory waterfowl moving between Boundary Bay and the agricultural lands of the Serpentine and Nicomekl River floodplains. Mallard, Wigeon, Pintail, Green-winged Teal and Canada Geese are the most common waterfowl found in the WMA. It is also habitat for Red-tailed Hawks, Northern Harriers, and other raptors including Bald Eagle, Osprey, and Peregrine Falcon. Passerines are abundant in the hedgerows and thickets of the Wildlife Management Area. Fish are present in some of the freshwater marshes based upon the presence of fish-eating waterbirds such as Hooded and Common Mergansers and Double-crested Cormorants. The area provides habitat for a number of mammals including Beaver, Muskrat, River Otter, Mink, Short-tailed Weasel, Townsend’s Vole and Eastern Cottontail Rabbit. Physiography, Climate and Vegetation: The lands are a combination of agricultural lands and wetlands that are managed for a variety of situations including freshwater marsh and wet soil farming. A former impoundment that forms an oxbow into the Serpentine River is subject to tidal flows and managed as a saltwater/brackish marsh. The WMA is part of the Coastal Western Hemlock Dry Maritime ecosystem within the Fraser Lowland ecosection. Compatible resource and recreation uses: Aproximately 16 hectares of the Serpentine Wildlife Management Area is managed as agricultural land to attract waterfowl. There are public walking trails and observation towers situated within the WMA. The management plan for Serpentine Wildlife Management Area was approved in 2000.